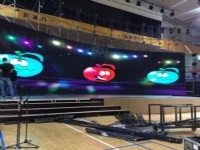 Desc: Used in TV station and use Curved Side Rental cabinet 500 x 1000mm,cuved angle can be adjusted around 14.5-17.5 degree, can be adjusted by customers. 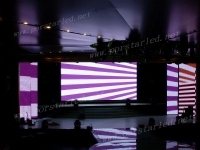 Desc: Use the LED Display for TV.EVENT showoing outside,put the big LED Display into two parts,left and right side. 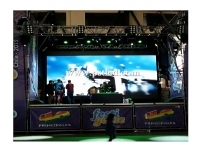 1.P9.375mm SMD Outdoor High Brightnes Rental LED Display. 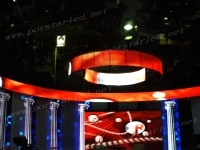 Desc: Take our new design on 2011 PR-Slim series P6mm LED Display, with 100pcs Slim rental cabinet 576mm x 576mm,just 8KG/pc with Aluminum rental. 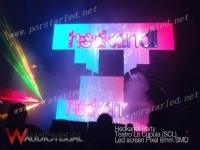 screen is used for Club and Night event in Santiago.High referesh rate and Brightness. 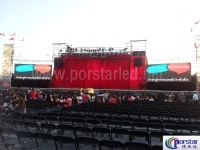 Desc: Take New design of P6.9mm Curved Side Cabinet 500mm x 500m,just 6KG, curved cabinet screen can be together as circle led screens, and curved cabinet degree around 23degree.